I began this project back in February of 2009, and since then, many others have joined in on the meme. Why do we transcribe? I provide my three reasons in the linked post. You may find others. If you participate, feel free to leave a link to your post in the comments. 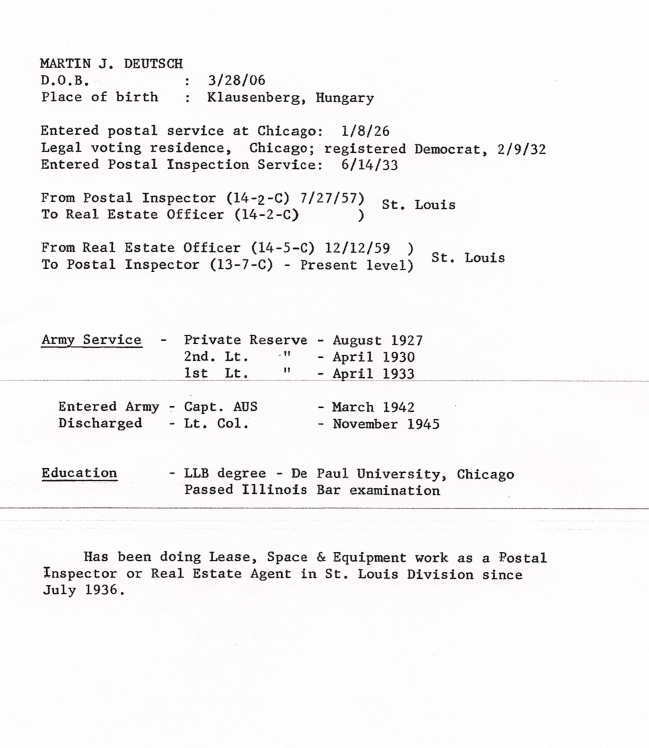 This week I transcribe a page from my maternal grandfather's Official Personnel Folder from the US Postal Service. Dated at some point after 1959, it covers most, but not all of his career. He retired in 1968. Has been doing Lease, Space & Equipment work as a Postal Inspector or Real Estate Agent in St. Louis Division since July 1936. 1) While this is dated after 1959, and thus after my grandfather's discovery of his birth certificate, he didn't correct his birth information with the Post Office. I can guess at possible reasons. He had previously thought himself to be one year older, and changing the information would have pushed back retirement a year. My grandfather claimed that he had believed he was born in 1906 prior to the discovery of the certificate. However, it is known that some of his brothers fibbed about their ages to get around child labor laws. He may have as well. 2) His birth place is indicated as Klausenberg, Hungary. This is present-day Cluj, Romania. We know he was actually born in Varalmas, Hungary (Almasu, Romania), a nearby rural village. 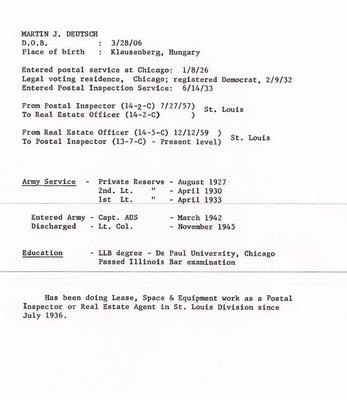 3) I find it interesting that his voting information was recorded in his Personnel file.